We would all be surprised if we knew how many people there are all over the world who go through a near-death experience. Although most of them don’t dare to speak about it, or can’t express what they have been through. More and more descriptions are being made public, reports written and even scientific researches published on this subject. 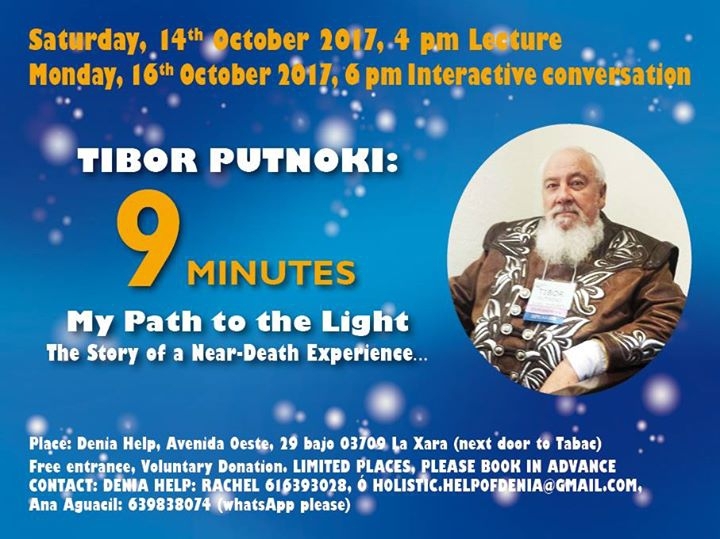 Tibor Putnoki went through a near-death experience in 1994, which has lasted for 9 minutes. This experience, not only changed his view of his earlier life completely, but also inspired the rest of his life: “People need to be told, they need to know not to live and act as they do, and I did”. After the interesting lecture on Saturday, everybody is invited to the interactive session where you can ask your questions or doubts on Monday the 16th, at 18:00 h.
WE WELCOME YOU WITH LOVE, PLEASE LISTEN WITH AN OPEN HEART! Todos nos sorprenderiamos si supiéramos cuanta gente alrededor del mundo atraviesa por una experiencia a la muerte. La mayor parte de ellos no se atreven a hablar de ello, o no pueden expresar por lo que han pasado. Más y más descripciones, reportes y búsquedas específicas se han publicado sobre este tema. Después de la interesante conferencia, todos estan invitados a la sesión interactiva en la que podrán hacer preguntas el lunes 16 a las 18:00 h.
LES DAMOS LA BIENVENIDA CON AMOR, POR FAVOR ESCUCHEN CON UN CORAZON ABIERTO!